Q. Can you tell us about your main role in this mission? There are two main tasks. 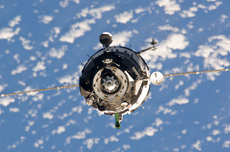 The first is to work in a Russian Soyuz spacecraft on the way to and back from space. The Soyuz can carry three people. I’m going to support the Commander as Flight Engineer. I will work with him to operate the spacecraft until it docks with the International Space Station (ISS), and on the return trip to Earth as well. The second task is the work I will carry out during my five-and-a-half months on the ISS. That includes performing various scientific experiments, as well as repairing faltering systems on the space station and controlling the robotic arms. Q. How do you feel about the teamwork with the other crew members aboard the Soyuz? Three people are going to board the Soyuz spacecraft: an American, a Russian and myself. This team is pretty good. American Astronaut Michael Fossum came from the U.S. Air Force and he’s a big-brother type person and very dependable. He is going to be Commander of the ISS during the latter half of this long-term expedition. Astronaut Fossum is a Mission Specialist for Extravehicular Activities (AKA space walks), and previously flew to the ISS with Astronaut Akihiko Hoshide on a mission to attach the Pressurized Module to the Japanese Experiment Module Kibo. Russian Cosmonaut Sergei Volkov, who is going to be Commander of the Soyuz spacecraft, is from the air force as well. He’s a mature person and a good leader. He’s a second-generation cosmonaut, following in his father’s footsteps. The three of us have been happy training together, and I feel like we are getting along very well. Q. What part do you specifically want the public to pay attention to on this long-term expedition? I’d like people to pay attention to the part where I can use my experience as a doctor. While in space, various changes to the body take place: astronauts’ bodies stretch and become taller, they have lower-back pain, the upper body becomes thicker, the face swells, and the legs become thinner. I would like to share these experiences with everyone from the perspective of a doctor. Personally, as a gastro-intestinal surgeon, I’m very interested in seeing how having a full stomach would feel in space. I hope to report back first-hand about the differences in the way my body feels in space and on the ground. In addition, if my fellow astronauts should happen to get sick or injured, I can examine them and manage the situation in cooperation with doctors on the ground. On the ISS, there is a set of tools to perform an emergency operation, for example if a crew member suffers a sudden cardiac arrest. So if something happens, I may need to perform minor surgery. Also, JAXA invited the public to suggest space-medicine experiments that would study how the human body changes in space. There were 110 proposals, of which JAXA selected ten. I’m looking forward to performing these experiments in space. Q. 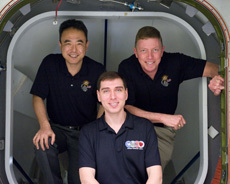 What kind of experiments are you going to perform in the JEM Kibo? 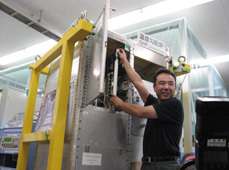 Astronaut Furukawa taking out a test-material cartridge from the temperature-gradient furnace, while conducting a Hicari experiment during training at the Tsukuba Space Center. I’m going to perform a number of experiments, but if I need to name three of the main ones, the first is an experiment on protein crystal growth. In the zero-gravity environment of space, there is no effect of gravity on heavy objects, so higher-quality crystals can be grown than on Earth. With better crystals, we can study the precise structure of protein. By analyzing these crystals, we can figure out the causes of the illness, and perhaps develop more effective treatment. The second experiment, which we’ve named “Hicari,” involves growing a crystal of a silicon germanium semiconductor used in optical communications. In this experiment, I will use an original method developed by JAXA, called Traveling Liquidus-Zone, to grow a semiconductor crystal with consistent composition. If I can prove this method works, we can apply it in industries that need high-quality semiconductor crystals. And the third experiment is the one that uses my own body. The same experiment, taking osteoporosis drugs called bisphosphonates in space, was performed by Astronaut Wakata and a few others. In space, our bones lose density about 10 times faster than on the ground, but by taking this drug, we may be able to prevent this bone loss. I think this experiment is preparation for a future space age, when anyone will be able to travel to space. Q. How will these experiments contribute to regular life on Earth? Take, for example, the protein crystal growth experiment. Dr. Yoshihiro Urade of the Osaka Bioscience Institute is already using this research to develop a treatment for Duchenne muscular dystrophy, an intractable illness in which the muscles become atrophied. Dr. Park Sam-yong of Yokohama City University is doing research on influenza treatment. Continuing to experiment with advanced protein crystal growth could lead to the development of treatments for various diseases that are currently difficult to treat, so I think this could greatly benefit our lives on Earth. The Hicari experiment to create high-quality semiconductor crystals is expected to improve the processing performance of computers and reduce their electricity consumption. Generally speaking, computer chips and laser oscillators perform less well at high temperatures. But with higher-quality semiconductor crystals, it is thought that this function could greatly improve. Q. What kind of training have you gone through for this mission? 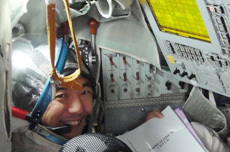 First, to master the operation of a Soyuz spacecraft, I went to Russia and studied. This will be only the second flight of this new-model Soyuz spacecraft. Most components are similar to the old model, but there are a few different ones as well, so we are training especially thoroughly on these new parts. We also had very thorough training on dealing with emergencies on the spacecraft. We also trained in dealing with ISS systems such as the U.S. and Japanese modules, and the experiments we are going to perform on our mission. This training was given to us mainly in the United States. Most of the training, though, is for emergencies. This is true both in Russia and in the U.S. The emphasis is on dealing with problems by cooperating with other crew members. Apart from these exercises, I also went through simulation training on use of the robotic arm to move equipment outside the space station. Throughout the whole process, I have been trying to take every opportunity to train. In addition to our instructors, there are a lot of people involved: facility administrators, schedule managers, etc. So I think I have to put my best effort into the training. Training is scheduled to continue until just before launch, so I would like to stay on my toes as we make preparations right up to the last minute. Q. Was it difficult for you, coming from a medical background, to learn to operate the Soyuz spacecraft? 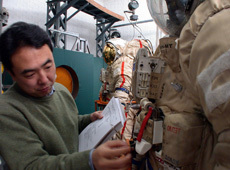 Astronaut Furukawa taking part in a lecture about the Russian Extravehicular Activity suit at an early stage of Soyuz spacecraft study. Yes it was. I first studied the Soyuz spacecraft in 2004, and became qualified as a Flight Engineer. But at that time, I sometimes couldn’t understand very well, even though I had studied the theory. Back then, I hadn’t been studying the Russian language for very long, so I think there may have been a language barrier. Now, most of the time, I can understand the technical language without an interpreter, but when I started training it was very difficult. To learn to operate the spacecraft, I think learning to fly an airplane helped me a lot. Learning to fly using instruments, I had to deal with every conceivable problem, and that really helped me develop my operation skills.